Nathusius’ pipistrelles are the largest pipistrelle species in Europe with a combined head and body length of up to 5.8cm and a wingspan of 25cm. Larger adults can weight up to 10 grams before their hibernation cycle begins, emerging at around 5 grams in the spring. The fur on their upper sides is red to chestnut brown in colour in the summer months which turns to a darker brown colour after they moult in autumn with their undersides remaining a light brown to yellow brown colouration throughout the year. The ears are small and triangular in shape with rounded tips. 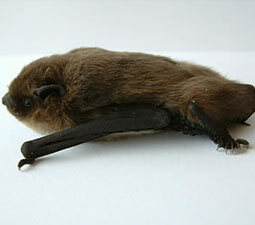 Nathusius’ pipistrelles have broader and longer wings than the other two Irish species of pipistrelle which allow for more maneuverable flight especially in confined areas. Irregular flight paths are used by this species with deep wing beats employed when flying in a straight line. Echolocation is used while hunting with this species using ultrasonic pulses in the 38 – 50 kHz range. 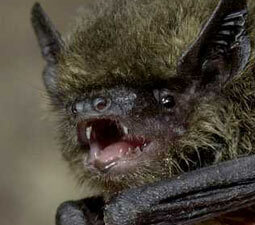 They are a relatively vocal bat species using a series of sharp whispering and chattering calls while communicating within the roost which will turn to a high pitched scolding sound if alarmed. Nathusius’ pipistrelles are mainly a forest dwelling bat species, they can be found in all types of Irish forests from moist deciduous woodlands to dry coniferous forests. They are also found in parks, farmland and woodland edges but are more rarely seen in urban settlements than other bat species although they are known to prefer lowland areas. Their summer roosts which serve as nursery roosts for their young can be found in tree cracks, crevices in building’s walls and in caves, they sometimes share these roosts with common pipistrelle colonies and will be composed of mature breeding females, their offspring and young juvenile females. Males tend to remain alone or may form small groups in the summer months. Roosts will be established in any location which allows a direct flight path from the site to their favoured hunting areas. Winter hibernation roosts are established in more covered areas of cliff crevices, caves and tree hollows. 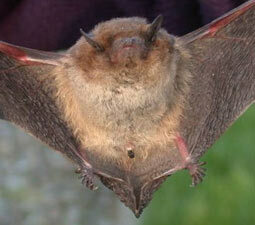 Nathusius’ pipistrelles normally emerge from their roosts within half an hour of dusk each evening. They forage in a wide number of different habitat types but are known to favour hunting along a particular regularly used route. They hunt for small to medium sized flying insects such as flies, moths, caddis flies, midges and mosquitoes usually catching them in their mouths while in flight but sometimes trapping prey with their broad wings or tail before transferring the insects to their mouth. Their hunting period is most intense at dusk but this can vary depending on the temperature and weather conditions. They prefer to hunt along woodland paths or along the edges of forests and over open water, they generally avoid hunting close to urban areas. This species will travel longer distances than the other two Irish pipistrelle types which tend to remain within 2 km of the roost site each night. Flying between four and fifteen meters off the ground the nathusius’ pipistrelle locate their prey by emitting an FM ultrasonic burst which rebounds off insects to give their exact location. 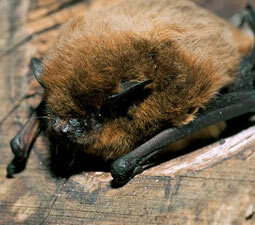 Mating habits are similar to that of the common pipistrelle with September to November being the main mating season. Male nathusius’ pipistrelles will establish mating territories within the winter roost to which he will attempt to attract a number of females to his harem by calling and making a series of fight displays. Births occur in the June to July period with one or two offspring produced after a period of delayed gestation. A breeding female produces one litter per season, young bats are cared for in large nursery roosts which can contain up to two hundred individuals. The young when born are pink in colour and blind, generally weighing 1.6 grams, they first open their eyes after three days and are capable of solo flight after only three weeks. The female is the only one to offer parental care to the young pipistrelles. Juveniles have a distinctive dark grey to brown body colouration which differs from adults. Females reach full sexual maturity after one year with the males needing two years to fully develop. The modern day bat family tree now contains 950 different species divided into 17 families. All Irish bat and pipistrelle species belong to the vespertilionidae and rhinolophidae families in the Chiroptera order. Bats and pipistrelles are believed to have evolved from small insect hunting mammals that occupied the tree canopy of forested areas of the Eurasian continent. The oldest fossils which gave rise to modern bats date from 50 million years ago. Past climatic changes such as the last Ice Age seriously affected the number and range of bats but they can now be found in most habitats throughout the world except for land areas near the poles. The current range of the nathusius’ pipistrelle in Europe is concentrated in central and east of the continent with more scattered populations being located in western European countries. The species is absent from Scandinavia, Scotland and all Mediterranean islands. On the continent it is a migratory species with whole colonies traveling long distances southwest each autumn before returning to their summer roosts in spring. In Ireland colonies are concentrated in the north and east of the country. This species is one of our rarest bats and may have only recently arrived on the island after coming over from Britain in search of roosting sites. The main threats to the species comes from the practice of chemical treatments of timber frames in attics which can poison an entire colony and make the area unsuitable for bats for up to twenty years. As summer roosts are established in mature tree trunks their destruction can occur with the removal of old or dangerous trees. Recent re-forestation programs will in the future help maintain the number of suitable habitats of the nathusius’ pipistrelle in Ireland once these plantations have time to mature. The increased use of pesticides in agriculture in recent decades has had a negative effect on the number of available insect prey on which the species is totally reliant, toxic accumulation of chemicals within the environment can also build up and poison bats over time. Nathusius’ pipistrelles are insectivorous mammals and are capable of consuming a large number of small winged insect prey on nightly hunting trips so they are a good form of natural pest control. The nathusius’ pipistrelle bat species is one of our rarest mammals and is protected under Irish, European and international law.